Friday Brown is a girl. All the women in the Brown family have been cursed, they all have drowned or choked to death. “They call me Friday. It has been foretold that on a Saturday, I will drown…”. Friday Brown’s mother, Vivienne, dies and seventeen year old Friday is trying to escape from her memories of her mother and the family curse. She runs away from home. In a train station, Friday makes friends with a boy called Silence, who is a ghostly white and has silvery hair. 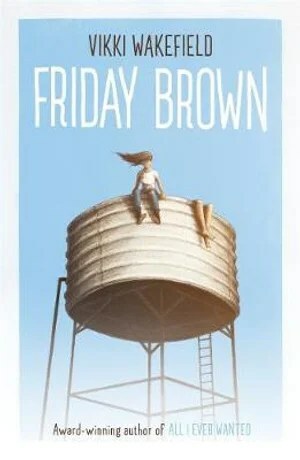 This book is absolutely amazingly written, I really enjoyed reading ” Friday Brown”. The characters are really creative – Arden, Friday, Grandad, Silence, Bree, Darcy, Carrie, Joe, Wish, Mailik, Vivienne and there are loads more!! The words Vikki uses to make the characters seem real is amazing!! She makes you feel like you are in the place where ever Friday is!! It has a good start.Great review. Wow!That sounds like an amazing book!